The aviation industry is a major source of greenhouse gas emissions. In 2011 aviation contributed around 3% of Australia’s emissions. Despite improvements in efficiency, global aviation emissions are expected to grow 70% by 2020 from 2005. While the industry is seeking new renewable fuel sources, growing biofuels takes up valuable land and water that could be otherwise used to grow food. That’s just what a new project in Abu Dhabi is seeking to do. 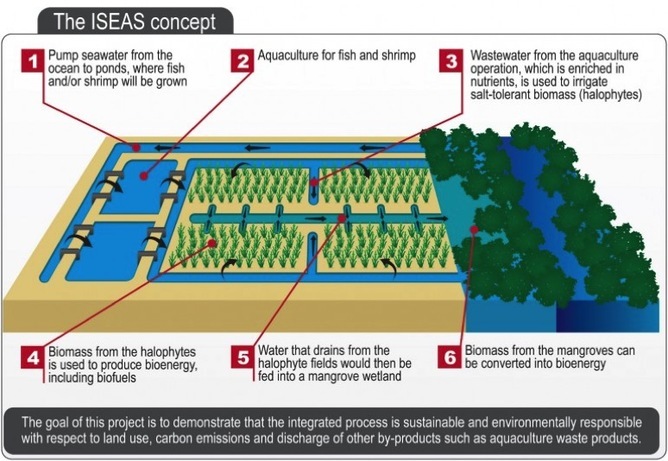 The Integrated Seawater Energy and Agriculture System, or ISEAS, will grow sustainable food and aviation fuel in the desert, using seawater and sunshine, in a way that is eminently transferable to similar arid regions around the world. Examples abound: think of wasteful irrigation coming up against water limits and threatening reductions in food production. But there are some projects that turn the issue around and bring water, energy and food issues into positive relations, each strengthening the others. One example of this is the Sundrop Farms project in South Australia, on which I previously wrote on The Conversation, where abundant sunshine and seawater are used to produce electric power and fresh water to cultivate greenhouse crops like tomatoes. The Abu Dhabi project is even more ambitious and is called “seawater farming”. It involves the use of salt-tolerant plants like mangroves and the oil-rich Salicornia as well as aquaculture of seafood such as shrimps and fish. Salicornia is a salt-loving plant that doesn’t mind getting wet. First, seawater is used in aquaculture ponds, where (2) fish and/or shrimp varieties can be grown (= food). Then (3) the wastewater from the aquaculture, which is rich in organic nutrients, is used to irrigate a salt-tolerant crop of Salicornia. This crop is harvested (4) and the oil extracted from the seeds (= aviation biofuel). Water is then drained from the salt-tolerant crops (5) and fed into a mangrove wetland, where it is naturally purified and carbon can be sequestered (6). Outside this sequence there is solar energy input to drive the crop production and energy production needed for pumping. The project solves the problem of waste disposal with fish farming (aquaculture) by channelling the organic wastes as irrigation to act as fertiliser for the cultivation of the Salicornia plants. The Salicornia plants themselves (known as halophytes, or salt-resistant species) need only the seawater and grow on arid land. The project eliminates the problem with most biofuels that they are perceived as taking away water and arable land that could be used for food production. Instead the Abu Dhabi project produces fuel and food and recycles everything. The current pilot farm is entirely closed-loop, with the seawater drawn originally from the ocean passing through the various stages and finally fed to mangrove plantations. The water is filtered through the mangroves, extracting the final nutrients, and the water can either be fed back to the ocean or recycled to the fish farms. All energy used (such as for pumping the water) is generated with a solar array – so there is no fossil fuel input at all. The project is achieving remarkable success because it is backed financially by large players – Etihad itself as the principal airline, the Masdar Institute of S&T, and corporate giants like Boeing. The project will scale up quickly. The pilot project is a plant covering 2 hectares, but in three years it is expected to grow to a 200 ha demonstration scale involving around 140 ha for the Salicornia cultivation, 30 ha for the aquaculture and 20 ha or more for the mangrove plantation. Could Australia do the same? Australia is a country with vast arid areas, copious quantities of seawater and sunshine – all the ingredients needed for a similar solar biofuel and food project. Australia has long experience in development of agricultural models that can cope with high salinity levels. There is a strong research tradition cultivated in West Australia with the CRC for Plant-based Management of Dryland Salinity and its successor the Future Farm Industries CRC – which had to close its doors in mid-2014 for lack of continued support. Such a project would produce food, both for domestic consumption and export; it would produce aviation biofuel and help restore a fuel processing value chain and again a domestic as well as an export product; and it would utilise water in a way that can promote a means of halting desertification and restoring fertility in arid areas. It is a big idea for a big country.